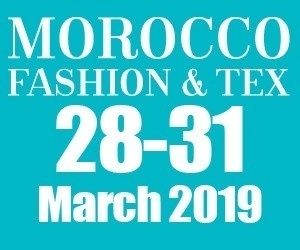 Morocco Style –5th International Fashion, Textile and Accessories Fair opens will be opening doors exhibition between from 28 to 31 March 2019 at OFEC, La Foire Internationale de Casablanca. With the remarkable success of the last edition Morocco Style 2018 were present by over 350 exhibitors from 7 countries: Morocco, Turkey, China, Pakistan, Taiwan, Portugal, Germany and about 15,000 trade visitors from Morocco and 32 foreign countries from West Africa, North Africa, the Middle East, the Gulf and Europe. With the participation of domestic and international textile professionals Morocco Fashion & Tex presents high quality products. Through Pyramid Group’s strongest network in Europe, Middle East and North Africa Morocco Fashion & Tex will be attracting thousands of visitors from Middle East, the Arabian Gulf, Europe, Russia & CIS Countries.